Initially, my reaction to the passing of Yogi Berra was sinking sadness, but…what a glorious life of unbelievable accomplishments to be celebrated. 10 rings? That record may stand forever. Yankee Stadium had the vibe of completeness when Yogi was in the house. All the Yankee reminiscing got me thinking about baseball ghosts. 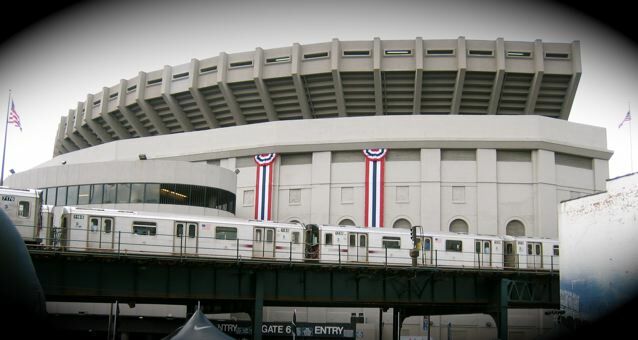 Everyone knows I love to read, write and carry on about the paranormal, but the ghosts of Yankee Stadium…I know they exist. I saw them. It was a moment…I was alone, but doesn’t the most extraordinary stuff always happen when you’re alone? July 31, 2007. Of course, Scott and I were in the Stadium when this logo was unveiled. We were there for every series from 2002-2010–sometimes twice a week. I don’t know how we pulled it off, but back then parking was $14 and tickets were $30-ish. We left NJ around 2:30pm and didn’t get home until midnight. I did it with no sleep. Scott somehow ran a business with those ridiculous hours. 161st St. and River Ave. was the center of our universe. 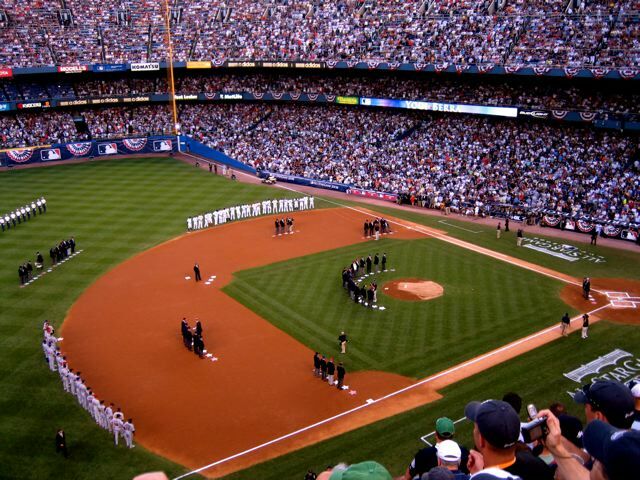 Once the All-Star Game was announced for the Final Season of Yankee Stadium, I was going…hell, high water or a massive credit card bill. This time the big $ on my Visa was worth it. All-Star Week was hot—typical July in New York. Insider, pre-game tip—hide in the back bar of The Dugout—their air-conditioning is cold enough to freeze your blood. Monday night was the Home Run Derby and Josh Hamilton put on a show for the ages. Our hearts were already rooting for him–crazy story for another day–but Aura and Mystique were in his corner too. The whole crowd was chanting his name, and the Yankee Stadium crowd rarely chants for anyone but a Yankee. They did that night. Josh rocketed home runs off the Utz Potato Chip sign, splintering old wood and leaving dents that would never be repaired…if anyone’s home runs deserved to land on River Ave… And he didn’t even win. But every Home Run Derby since, they show clips of that legendary performance. Looking through pictures from that All-Star Week triggered a slew of memories, like Mariano playing catch with his sons. The dancing mascot parade. 3 Doors Down’s awesome performance and the band members running up to Mariano in the dugout afterward—to shake his hand—the best closer in the history of baseball. Mariano, Derek and Alex playing host to the entire baseball galaxy and an opening ceremony that only the Yankees could pull off. All-Stars and Hall of Famers from every position on the field together, and oh yes, the Stealth Bomber—no opening ceremony since has come close to that one. I’m pretty sure none ever will. Okay…enough babbling, back to the ghosts. 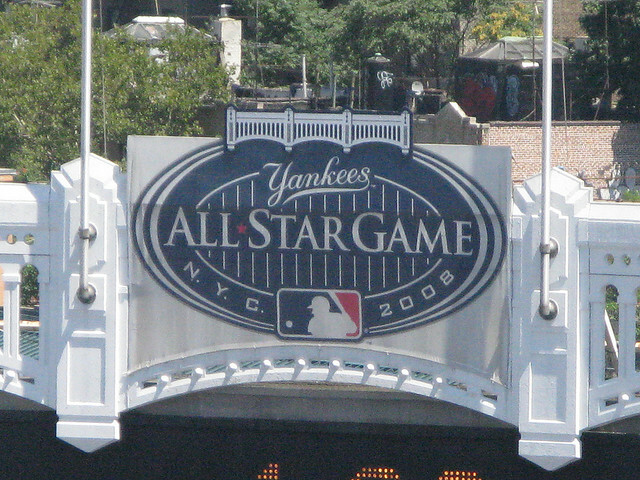 The 2008 All-Star Game went 15 innings. 4 hours and 50 minutes. I watched the full moon rise above the right field bleachers, creep over my head and set behind the grandstand. It was a long night and by 1:15 am, the third tier was almost deserted. The last train was gone, the lightweights and corporate types had disappeared and only the real baseball fans were still in the stands. I ran to the bathroom between innings—had to hurry—didn’t want to miss anything. Anyone who knows old Yankee Stadium, knows how crowded that upstairs tier was and how pitifully small those restrooms were. I jogged out of the tunnel, stepped into the concourse and stopped cold. Nobody was there. No lines, no jostling It was empty—not another soul in sight. I was absolutely alone, but I sensed a crowd swelling around me. The air glimmered at the ceiling and pulsed along the floor. I’m sure it was only seconds, but time wobbled and paused when I stumbled into that fringe of the past. I could still hear the noise of the game behind me, but it sounded distant and grainy…like a snippet of history echoing in the limestone walls. The Cathedral of Baseball, a leading lady in the final run of her brilliant career, was holding court with the ghosts and the legends for one last summer…savoring every pitch and every minute she had left.